Tomorrow excavation will continue in the two new squares in SAV1E. 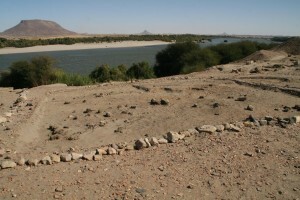 The northern square is illustrated in the photo, with a first mud brick structure in its north western corner (to the left in the foreground on the photo,at the end of week 1 and still in rough outline). The material associated with it suggests a date to the New Kingdom: A total amount of 2776 diagnostic sherds has been processed in our first week – of which 880 are datable to the 18th Dynasty (32 %). A small amount (14 pieces) dates to the Ramesside period; the remaining material originates from the Post-New Kingdom and here predominantly from the Post-Meroitic and Christian as well as the Ottoman period. This entry was posted in Archaeology, Ceramics, New Kingdom, Settlement architecture, Upper Nubia by Julia Budka. Bookmark the permalink.